The world was at war on Dec. 6, 1917, and the harbor of Halifax, Nova Scotia, was a busy seaport with both allied naval ships and vessels of the Merchant Marine both coming and going, all carrying important cargo in support of the war effort. Into this busy seaport entered the Mont Blanc, a rusting, unobtrusive-appearing 320-foot vessel flying the French flag. 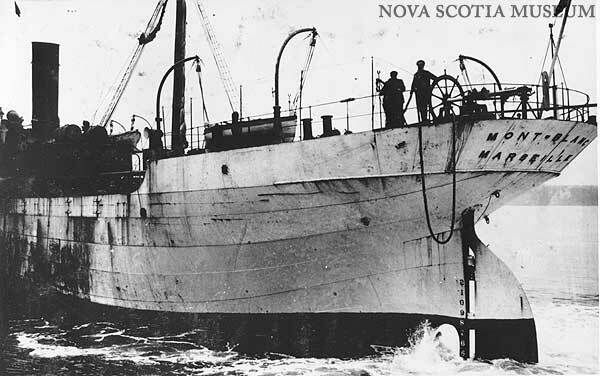 This single-screw, 18-year-old freighter looked relatively safe, but unknown to port authorities or the people of Halifax, the ship was a floating bomb. It was routed from New York to Halifax, to join a convoy on its way to France, with its holds filled with 2,300 tons of wet and dry Pitric acid, 200 tons of TNT, 10 tons of gun cotton and 35 tons of Benzol. The ship also had mounted fore and aft guns with about 300 rounds of ammunition stacked on its deck. It was noted that the Mont Blanc was not flying a customary red flag, warning other vessels that its cargo was explosive. Also in the Halifax harbor that morning was the Imo, a former Norwegian whaler that had stopped the previous day to take on coal while on its way to New York to pick up relief supplies bound for Belgium. The Imo weighed anchor and was steaming back out to sea as the Mont Blanc was entering. The two ships collided in a bottleneck known as the Narrows, the bow of the Imo slicing a wedge in the side of the smaller ammunition ship and starting a fire in the picnic acid stored directly under the drums of benzyl on the deck. The French crew, well aware of the extreme danger of a fire in the midst of that volatile cargo, made no effort to fight the blaze which was immediately burning out of control. At the order of Captain Aime Le Medec, they abandoned ship in the small boats, and shouted an alarm as they rowed for Dartmouth, putting as much space between them and the disaster they knew was about to happen. Unfortunately, that French crew spoke no English and the people of Halifax did not understand what they were saying. The blazing Mont Blanc was adrift and as it burned, it drifted up to Pier Six, where the fire spread to the wooden pier and some adjoining buildings. Members of the Halifax Fire Department responded and were setting up to fight the fire. Harbor tugs also were responding, their pumps already pouring water into the blazing ship. In the meantime, the people of Halifax were gathering around the harbor to watch the drama unfolding before their eyes. The ship burned for about 20 minutes before it blew up, thus giving people lots of time to gather in harms way. It was estimated that about 1,600 people were standing along the harbor piers to gawk Others were standing at their windows when the Mont Blanc disintegrated in what was believed to be the biggest man-made explosion preceding the nuclear age. At 9:05 a.m. that explosion, which was felt more than 100 miles away, virtually leveled much of the City of Halifax and killed over 2,000 people. Another 9,000 were injured. The blast destroyed 325 acres, almost all of the north-end of the city. Several nearby ships in the harbor, including the Imo, also were destroyed and their crews killed. Right afterward came a super wave, or tsunami, estimated to be at least 30-feet high, that swept bodies out to sea and drowning many who might have survived the explosion. Among the casualties of that super wave were members of a tribe of Micmac Indians, encamped at Tufts cove a few miles away. They said the wave washed away the entire encampment. A photograph of the smoke from the blast, taken from miles away, shows an almost mushroom-shaped cloud, perhaps a premonition of what was to follow in the next world war. Many buildings that were not immediately leveled by the blast burned to the ground. It was said the fires were aided by winter stockpiles of coal in the cellars. Parts of the Mont Blanc were found miles away. Part of the ship's anchor was found two miles from the center of the explosion. Windows were shattered as far as 50 miles from the scene, and the shock wave was reportedly felt in Sydney, Cape Breton, 270 miles to the northeast. A disaster of that magnitude was more than local authorities were equipped to handle. Hospitals could not cope with all of the wounded. It happened in the midst of winter and there was a shortage of housing. To make matters worse, the city was hit by a blizzard the following day that dumped 16 inches of snow. As word of the disaster spread, a world-wide relief effort soon got underway. A relief group provided clothing, money, furniture and soon had a major reconstruction project underway. They said three thousand houses were repaired within the first seven weeks. Temporary apartments were constructed that winter at the rate of one every hour. Over 1,500 victims were buried that winter, many of them unidentified. Other bodies were not found until the next spring when the snows melted and the rubble could be excavated.